How often do typhoons visit Batanes? For ages, the rest of the Philippines have always associated Batanes with typhoons. Well, it’s not entirely wrong but it is grossly exaggerated. It is true that the likelihood of a typhoon is higher in July, August, and September months compared to the other months of the year. This is true in the entire eastern side of the Philippines from Bicol to Batanes. If we look at the historical path of typhoons in the Philippines since 1902, the entire eastern side of the Philippines from Visayas to Luzon has been hit by typhoons. 6 typhoons have hit Batanes directly in the last 30 years. Perhaps any Ivatan 50 years old and above have seen probably 10 already in their entire lifetime. If you are only visiting Batanes for a few days, the probability of you meeting a typhoon in Batanes is less than 1%. It is extremely unlikely. So why is it that people outside of Batanes have come to associate Batanes with typhoons? PAGASA and the media use Batanes as a reference point when reporting the weather. We hear this often in the media: “Typhoon is 350 kilometers east of Basco Batanes”. Even a typhoon that is 350 kilometers from Batanes is nowhere near Batanes (it may even be fair weather in Batanes in this distance). Since the weather bureau and the media have no other province to reference their reporting, Batanes gets the distinction. So, the next time you hear Batanes and typhoon in one sentence, pay attention to the distance and the direction. There are typhoons that might not directly hit Batanes but could have an impact on the province. 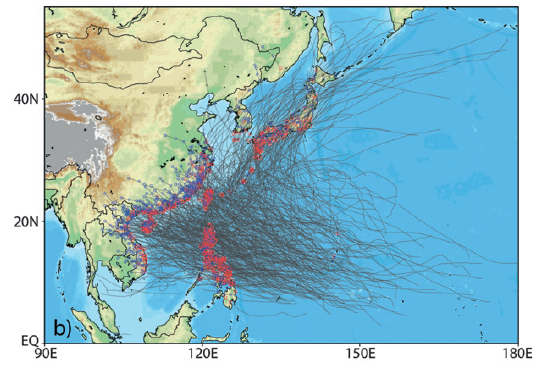 For example, waves can be rough even for typhoons that are still hundreds of kilometers away. This will make travel by sea dangerous. Heavy rains can result in poor visibility that can lead to flight cancellations. If ever you get that rare chance of experiencing a typhoon in Batanes, don’t worry, the stone houses of Batanes have been tested to withstand the fiercest of winds. I have never heard of any casualty in Batanes even for a category 5 like Meranti/Ferdie in 2016. So don’t worry about them, just bring your rain gear, go and have fun – any day of the year. There are far better things that can happen than worry about typhoons. If you want to visit Batanes, please do get in touch with us on these contact points and we’d be happy to talk to you.